Chatan Bowl is in a big sports center which most base personnel would probably not think of visiting, as bowling is normally cheaper and better on base. If however, they go to the floor above the bowling lanes there is Kitakaisen Sushi, a truly excellent, spacious Japanese style restaurant, with tables, a tatami area and an area that can be sectioned off for parties. The place is already fairly popular with foreign customers but could be a lot more so. The manager Kozo Senda estimates ten percent of his diners are Americans. The menu is a mixture of Western, Japanese and Okinawan specialties. Seafood makes up 30% to 40% of the fare. Dishes like tempura and fried squid are popular with Westerners, while locals go for the Okinawan style steamed pork. The chef has also devised some original creations like fish eggs and chips. DG sampled Chicken With Hot Spice at ¥550, slices of chicken garnished with sauce and pieces of ground black pepper. It was delicious and unusual fare for a Japanese restaurant. Kozo said it is becoming very popular with his non-Japanese customers. The Special Seafood Salad at ¥680 was conventional in its mixture of shredded greens and dressing but unusual in the pieces of sashimi that had been added. It was an effective combination and is also much requested by Americans. A plate of Fried Pork With Garlic Sauce at ¥400 looked like very fatty rinds but was surprisingly unsaturated, crunchy and tasty. The Combination Sashimi at ¥950 was a delicious mix of expertly blended tastes under rice and melt-in-the-mouth seaweed. 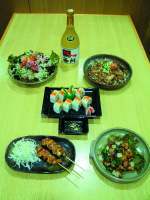 There are umpteen combination sets to choose from in this restaurant but those who are not locals tend to favor selecting individual dishes from the menu. However the combinations that are popular are the sushi sets. These are up to the standards of freshness expected in the best Japanese establishments. Thirteen pieces of sushi here cost ¥1,500 but if you sample them from Monday to Thursday between 5 pm and 7 pm they are half price. Similarly ten piece sushi sets can be had for ¥500 between these hours, half the normal price. Beer prices are also much reducing during these times, ¥250 for a large mug instead of ¥450. 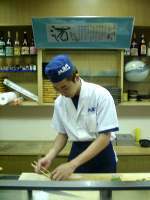 The atmosphere of Kitakaisen Sushi, with its large airy interior and light colored wood is spacious and clean. There is ample parking space, including under the building, if it rains. If customers want to have private parties here, there is screened off space enough for 60 seated and 100 standing. The main reason to eat off base is to sample a cuisine and atmosphere that cannot be found there. In this respect Kitakaisen Sushi, with its authentic setting of a traditional Japanese pub, fits the bill admirably. It also has enough variety of indigenous dishes to provide plenty of opportunity for adventurous forays into another culture’s cooking. But it also has a lot of choices for those not yet ready for the 100% exotic taste experience. A mixed party of Japanese/Okinawan food fans and those who have never yet sampled the host country’s cuisine would be quite satisfied here. Directions: Coming from Kadena Gate 1 along Highway 58, take a left up Route 23. Take the first right and follow the road for a few hundred yards until you see the Chatan Sports Center inside a large fenced area. Kitakaisen Sushi is on the second floor above the bowling alley.